After making an early order of four varieties from Stokes Seeds, I was on a mission to propagate my strawberry seedlings. After a all, a little research mentioned that strawberries started from seed in December to around mid January allowed the plants’ ability to produce fruit the first year. Since my family has a large outdoor, open air hydroponic system that can host 2500+ plants spread over 9 row, I decided we could use two rows just for strawberries; especially after noticing they are often in the groceries year round. Thus, in a nutshell, we will plant over 400 plants in the two rows. 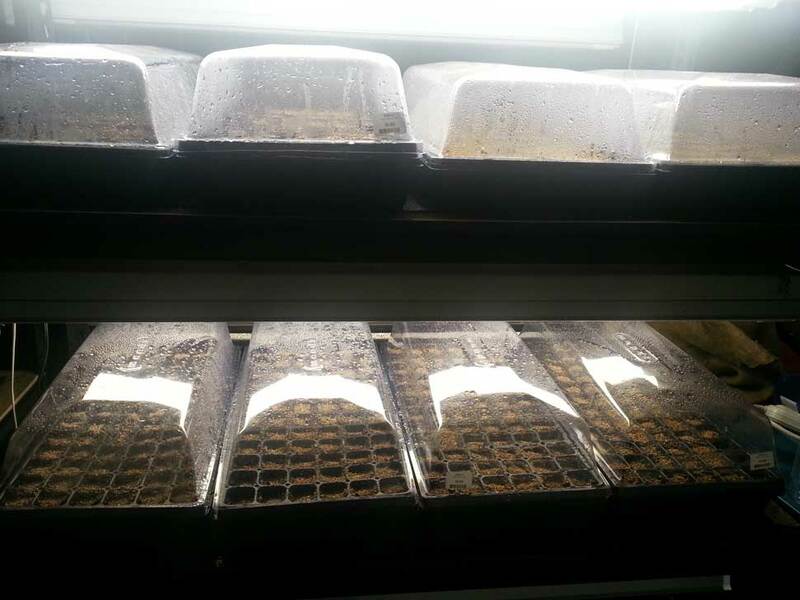 So, I bought 1045 seeds and started them over a two week period starting the first week of January. 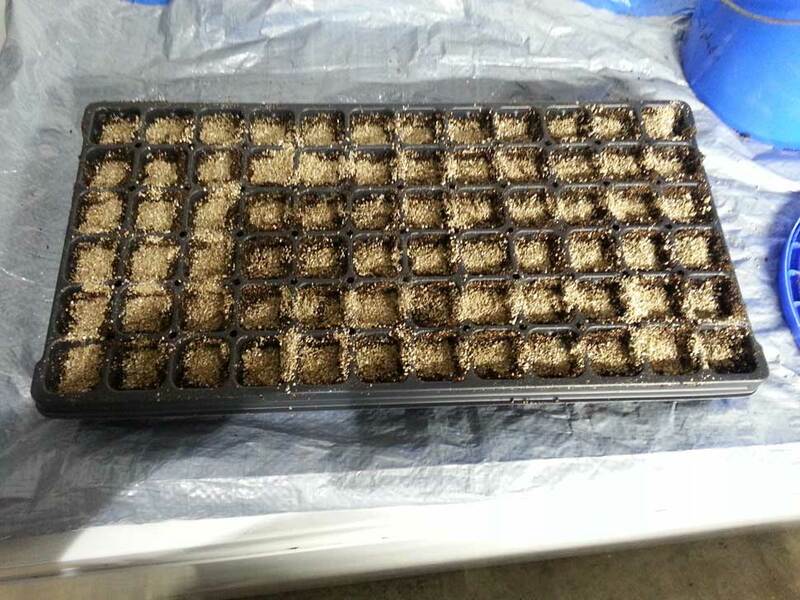 Since strawberries are slow growers at first, I prepared 72-flat plugs with peat / vermiculite mix. The Internet spews out 20% as the vermiculite ratio so often it gives me headaches. But, I find you don’t need much; say 10% or even lower like 5% will keep peat loose while keeping costs down. 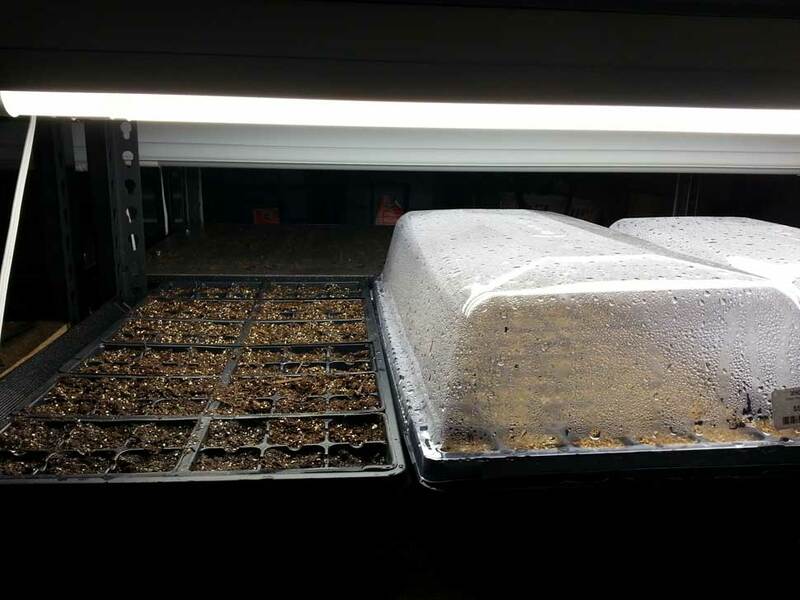 Once the peat and vermiculite is mixed up and inserted into the plug trays, we can use another tray and place it on top to pat it down a little. Then, we use a seed sower and drop 1-3 seeds into each plug. After that, we simply add a small layer of vermiculite to the top, like 1/8-inch. The vermiculite is great because it holds lots of water and air. Thus, seeds germinate well but don’t get over-waterlogged. Its ph over 7 also is a good feature for the mix, although watering ph is always the most critical. Since strawberry germination can be anywhere from 1-5 or more weeks, we want seedlings that are strong and won’t die from damping off. After the strawberries are in the trays and topped with vermiculite, we can use a pump sprayer and soak them until they are thoroughly moist. After that, we place a 4″ dome over them and place them on a heat pad. Since strawberries need light for germination, we can light one set of our daylight led lights located on top of the domes. For success, we can use 2, 4-foot fixtures for 4 flats, which is over 280 plants in a small area 2ft x 4ft. Each day or two, a good misting with a pump sprayer will help keep the top moist and aid germination. After a week, some will pop up. After two weeks, some plugs will have more than one plant. 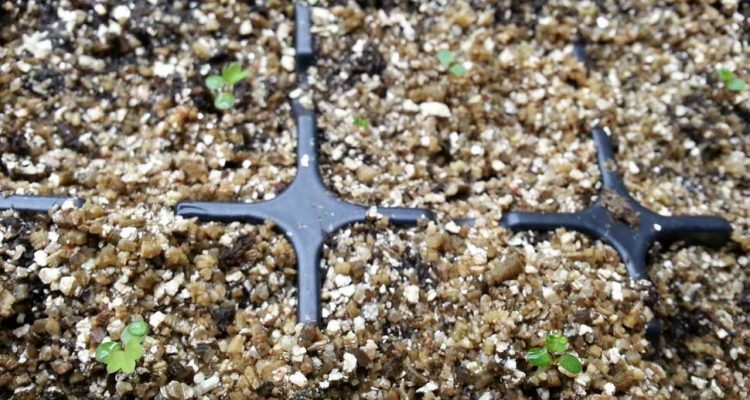 When strawberry germinants have the first two round leaves, or the first real leaf, they can transplanted to a new plug. Gentle hands are required. But, scooping them out with a mini shovel or spoon is quite easy because they usually have a single long root that comes out easily. When placing them into new cells, they just need a hole, placed inside and covered up. We just must make sure not to be forceful and over-bend and break the roots. This transplanting can go on for weeks. Meanwhile, after the first week, we can switch on our second light fixture so that our plants have decent lighting. Having followed these instructions, we had over 85% germination rate and did not lose one plant to damping off. In addition, we could keep the domes on multi-seeded flats for up to 4 weeks without issues. However, when we transplanted the seedlings to new flats, we placed the lights 3-inches from the tops and removed the domes. The domes were only used for the seedlings the flats that had 1-3 seeds per cell. So, if strawberries are your thing, regular, in frozen smoothies and chocolate coated, hopefully this experience can help. 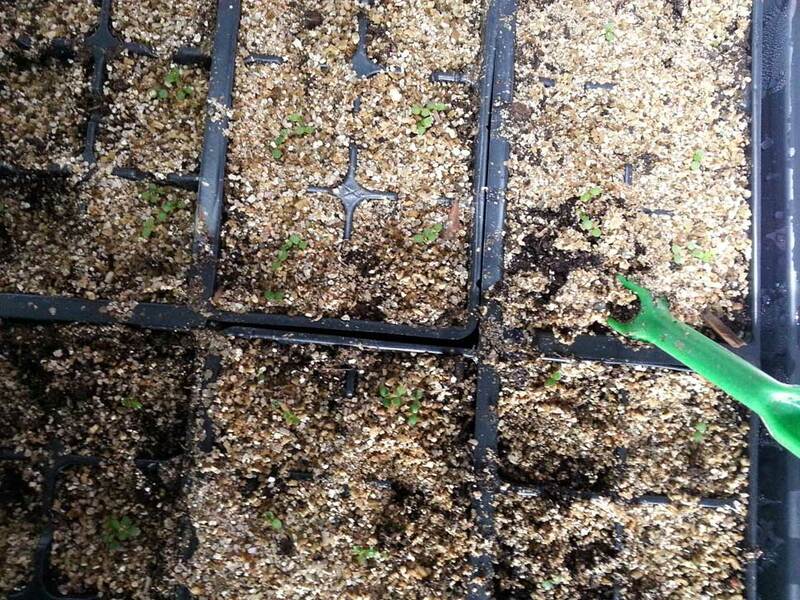 As time moves on, our seedlings will grow and need different care. 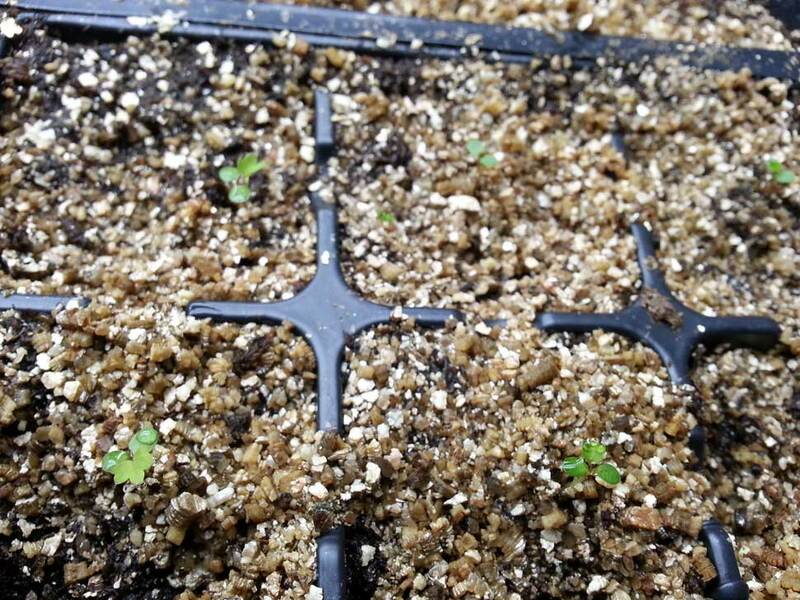 This post explains how to care for strawberry seedlings at four to six weeks of age.